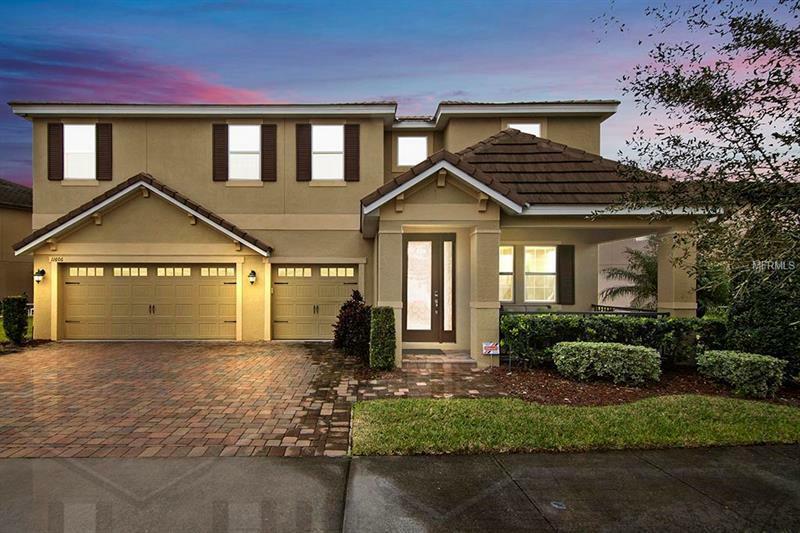 Move In Ready 5 bed/4 bath pool home in Windermere's Lake Burden South with nightly views of the Disney World fireworks! This spectacular K Hovnanian "Sugarloaf" plan features formal living & dining rooms, large family room w/soaring 2-Story ceiling along w/the great windows allowing light to pour into the house. The gourmet kitchen overlooks the living area & has a guest bed & full bath on the 1st floor w/ the owner's suite & 3 of the guest bedrooms upstairs. The Large owner's suite features a tray ceiling, double closets, bath w/granite vanity w/2 sinks & jetted tub & shower. All beds upstairs open to the loft, which makes a great playroom. Upgraded ceramic tile floors on first floor with upgraded carpet upstairs, freshly painted Agreeable Gray, newer fans, smart home additions & lighting fixtures, and a new pool heater added to the home in 2018. The gourmet kitchen has been beautifully upgraded & includes recessed LED lighting, 42" custom wood cabinets w/crown molding, hardware, tile glass backsplash, granite counters, breakfast bar, island and a closet pantry. The large family room overlooks the beautiful screened patio & pool that has party lights hung inviting you to entertain. Oversized lot with no immediate rear neighbors this back yard is welcoming. Community has trails, playground, tennis courts, a fishing dock and more. Walking distance to new developments with Starbucks, Publix, restaurants and more. Zoned for the New Windermere schools! Only 10-15 mins to Magic Kingdom & Disney Springs!